Phew, hasn't this year flown by? How it can be November again already? That means Thanksgiving is just around the corner. Send your loved ones a sweet-as-(pumpkin)-pie Thanksgiving message with this quick and simple cross-stitch card tutorial. First thing's first: take some time to prepare your materials. The first thing to do is set aside the card and tape until later. Take the aida fabric and find the centre by loosely folding it in half, and then half again. Gently crease it so that when you unfold it, you can see the central point of your fabric. You can either start stitching in the centre or count squares from the centre to an outer edge and start there. To find the centre of your chart, simply count the number of stitches in the widest row and divide by two. Repeat for the widest column and then cross-match the two to find the centre stitch. I've started stitching the row at the bottom of the pie, which is 13 stitches wide. To determine the centre stitch, I subtracted one and divided by 2 - so that the 7th stitch is the centre stitch. Once you’ve decided where to start stitching, take the appropriate colour of thread and cut a length approximately 30cm long. You only need to use two strands of thread, so separate those out and thread your needle. Find your starting point and insert your needle into the bottom left hole of the square you want to start at, from the underside of the fabric. Draw the thread through slowly and steadily, so it does not knot or get snarled up. Don’t pull too hard or the thread will come through and you’ll have to start again! Once the thread has been drawn through, leaving a tail of approximately 3cm, insert the needle into the top right hand corner of the same square from the top side of the fabric and pull the thread through. Now repeat this to form the second leg of the cross – from the underside, insert the needle of the top left hand corner of the same square and pull the thread through, with the cross being completed by entering the bottom right-hand corner from the top side. That’s it – you’ve made a stitch! Essentially, you just need to do this over and over again – easy, eh? But first, you want to secure the end of your thread so it doesn’t unravel. As you continue stitching, catch the tail of your thread along the underside of your fabric and stitch over it as you go, securing the thread under your stitches. This will secure your threads and stop your handiwork coming loose. If you're feeling like a maverick, you can always tie a knot in the end of your thread and skip this step! Once you're under way, you can carry on creating individual stitches, or do blocks of colour by creating a whole row of half stitches and then going back along the row, completing them. The latter method is useful for doing large areas of the same colour, e.g. the pie dish, or the pie crust. When you’re ready to switch to a new colour, or you run out of thread, finish a stitch and on the underside of the fabric, weave your needle in and out of the back of your stitches a few times and draw the thread through, taking care not to go through to the front side. This will secure the end of your thread and stop any stitches coming undone. Back-stitching around a design can really make it stand out, especially if your stitches are similarly coloured to your fabric. Using black thread, separate out just one strand and thread your needle. Starting with the pie dish, carefully outline the stitches with a back-stitch. Bring the needle from the under side at the right hand bottom hole, and back through on the next left hand hole along, so you're always working back the way. Move on along the row, and carry on until you've outlined the dish. You'll see that it stands out much more from the background. Carry on and outline the pie, and add in the steam holes in back-stitch, too. Doesn't it look much more defined now? Take care to keep your threads neat and tidy – try to keep all your stitches going in the same direction and make sure you check your chart carefully at regular intervals to ensure you don’t go wrong. You may find it useful to cross off the stitches you’ve done with a pen as you go. To complete your design, add the text in back-stitch. Using the same principle as above, simply count the rows to where you wish to start, cross-checking the chart with your fabric, and complete the text in back-stitch using two strands of thread. Now your design is finished, gently smooth out your fabric and take a warm (but not hot) iron and with a spritz of water, iron the back of your stitches. You can use a clean tea-towel on top to protect them. Lightly press the fabric, taking care to iron out the creases you added at the start. Take your card and unfold it so that you can use the aperture as a template for cutting your fabric to size. Place the aperture over your design so it's in the centre. Trim the excess fabric and then place the finished design in the card, face down, so that you see the design through the aperture on the front of the card. Take care to ensure you get it in the centre and it is orientated the correct way. You can either stick down the fabric with tape, or use glue, as you won't see the back once the card is folded back up. If you're using glue, ensure it doesn't seep through onto your design. Once you've stuck it down, fold up the card and place the whole thing under a heavy book for a while to flatten it out and ensure it doesn't gape when it's stood up on your loved one's mantelpiece. Et voila - you're done! In this tutorial you learnt how to cross-stitch a playful Thanksgiving greetings card. Now you just need to decide who to send it to! 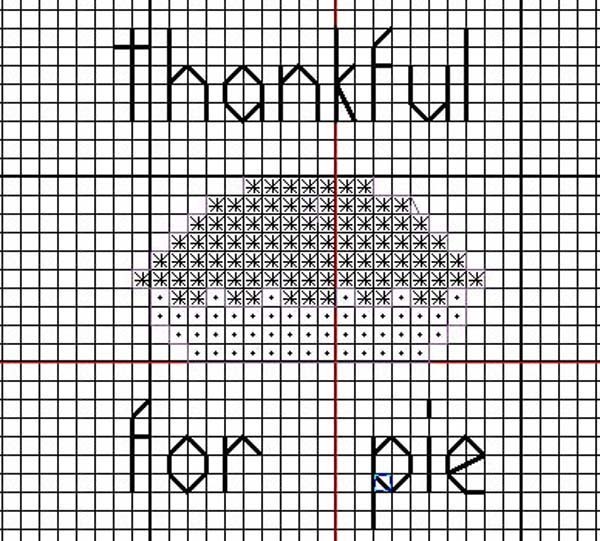 If you're feeling adventurous, you could even stitch this motif onto napkins for your Thanksgiving table. How did you find this tutorial? If you'd like to try another Thanksgiving craft, have a look at our tutorial on how to make a Thanksgiving wreath. 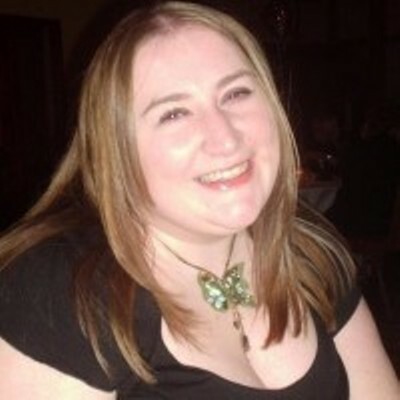 I'm Claire Brown and I live near Glasgow, in Scotland. I founded The Bellwether (formerly known as Miso Funky) in 2005 - we make cross stitch homewares with a very modern twist as well as designing and producing kits and patterns. When I'm not cross-stitching, I write about craft and indie business, as well as being co-founder of the UK's most popular kawaii blog, Super Cute Kawaii. I also work as a production manager with a television company. I don't get much sleep.